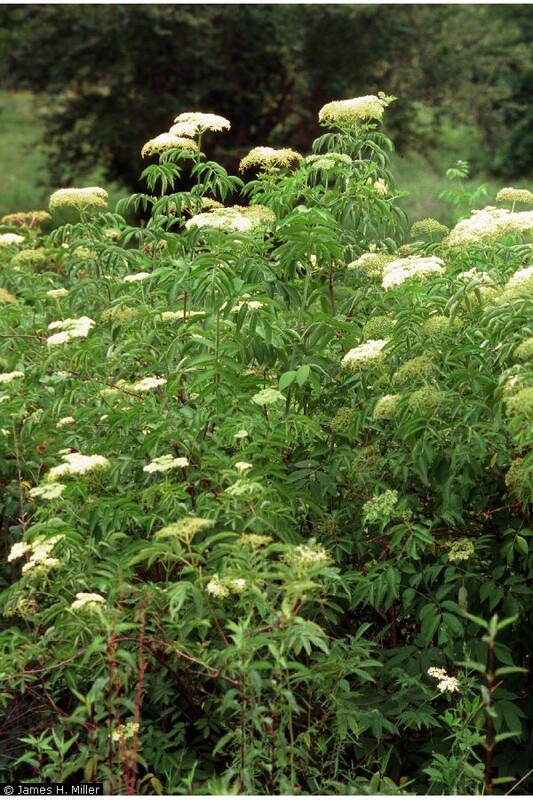 Sambucus nigra spp. canadensis. ©James H. Miller. hosted by the USDA-NRCS PLANTS Database.James H. Miller and Karl V. Miller. 2005. Forest plants of the southeast and their wildlife uses.University of Georgia Press, Athens. (Accessed 8/2014). Sambucus nigra ssp. canadensis is a shrub to 4 m tall, arching, spreading, open habit, internodes long, young stems green, nodes ridged, woody stems with white pith, bark pale gray with raised speckles (lenticels); winter buds scaly, conical, leaf scars broad, conspicuous. Sambucus nigra ssp. canadensis leaf. John Cardina, The Ohio State University. giant hogweed look a like. maine.gov (Accessed 2/2018). 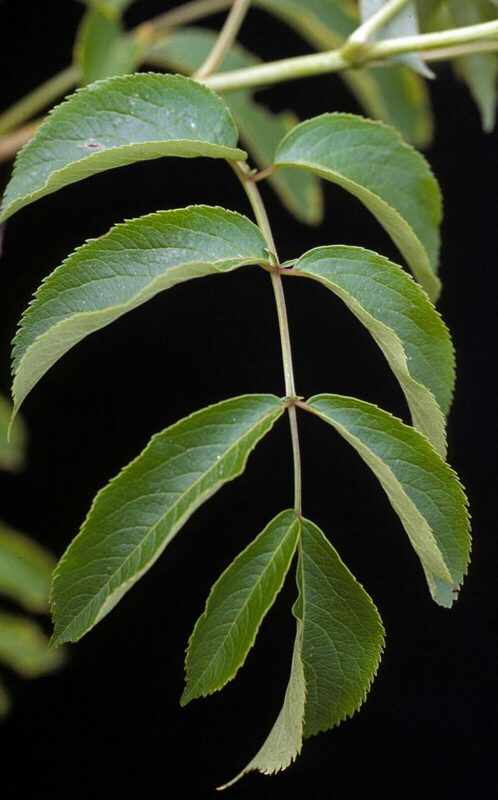 Leaves opposite, pinnate, leaflets 5-11, variable, lower leaflets often 3-parted, sharply toothed, tip tapered to long point; young; leaves expand late April-early May; winter plant leafless 142 days (Britton 1874). Sambucus nigra flowers. Matthew Beziat. NFEUS. 7/2017 (Accessed 2/2018). 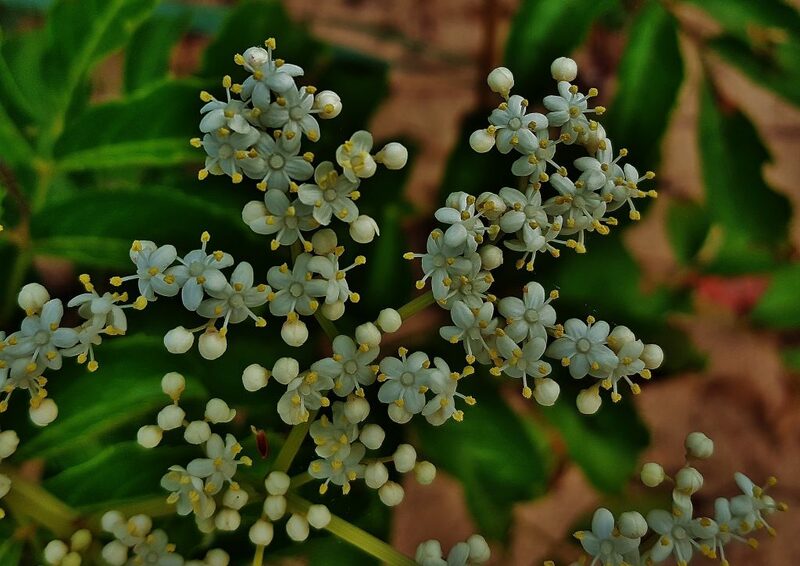 Flowers white, fragrant, 0.3-0.5 cm; inflorescence of broad, flat, branched clusters at ends of branches, June-July. Sambucus nigra ssp. canadensis.Theodore Webster.USDA Agriculture Research Service.forestryimages.org (Accessed 5/2015). Fruit black-purple, 0.5 cm, 3-5 seeded, July-Aug., bird dispersed. Seed load 21%. Pulp nutrients: water 88%, lipid 5%, protein 9%, CHO 44% (White 1989). Fruit eaten by many song and game birds. Also eaten by many mammals including raccoons and opossum (Wilson 1993). Twigs and foliage eaten by rabbits, deer, woodchucks (Martin et al. 1951). Habitat: Moist to wet, open areas, swamp forest gaps. Usually dies off when canopy closes. Also in freshwater tidal and nontidal marshes, wet edges, shrub swamps, forms thickets. Soil pH 5-8.9 (USDA, NRCS 2010). Tolerant of flooding or saturated soil for up to 25% growing season; drought, soil compaction; probably tolerant of concrete debris. Moderately tolerant of part shade (will not bloom or fruit in dense shade). Intolerant of salt (Hightshoe 1988). Notes: Stressed plants susceptible to infection by the saprophytic fungus Schizophyllum commune (splitgill fungus; Basidiomycotina, Hymenomycetes), which is also an opportunistic parasite. Fruiting bodies are stalkless, gray-white, hairy, fan-shaped bracket fungi to 5 cm wide, with split gill edges. They grow on infected wood, dead wood killed by other pathogens, or often on other fungi that have attacked the host plant. This fungus reportedly can also infect the mouths of humans that eat it. 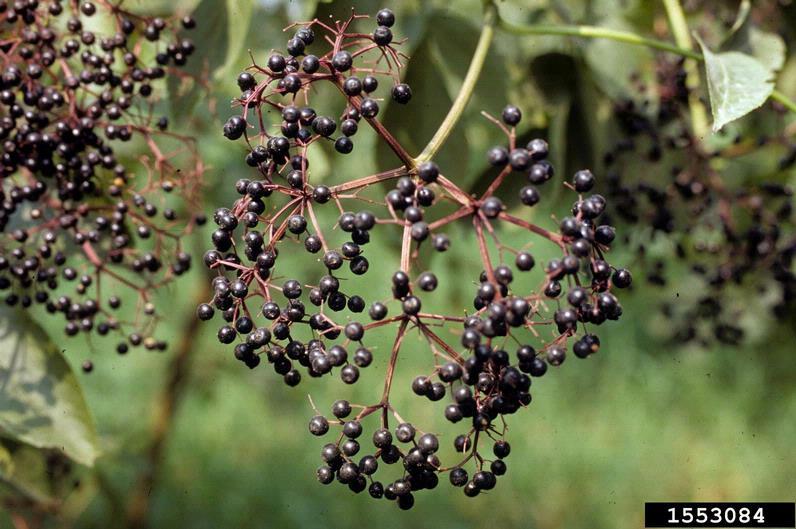 Elderberry can also be infected by tobacco ringspot virus (TbRSV) and tobacco mosaic virus both of which causes dark green mottle. Both these viruses are classified as nepoviruses, transmitted by nematodes (Sinclair et al. 1993; Agrios 1988; McKnight and McKnight 1987).